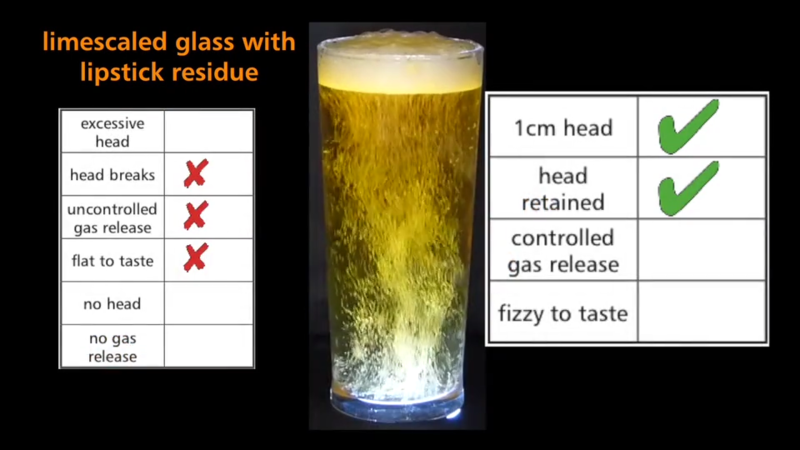 Half an hour after the initial pouring of the lager, there's still a head on the glass; the lager is still fizzy. 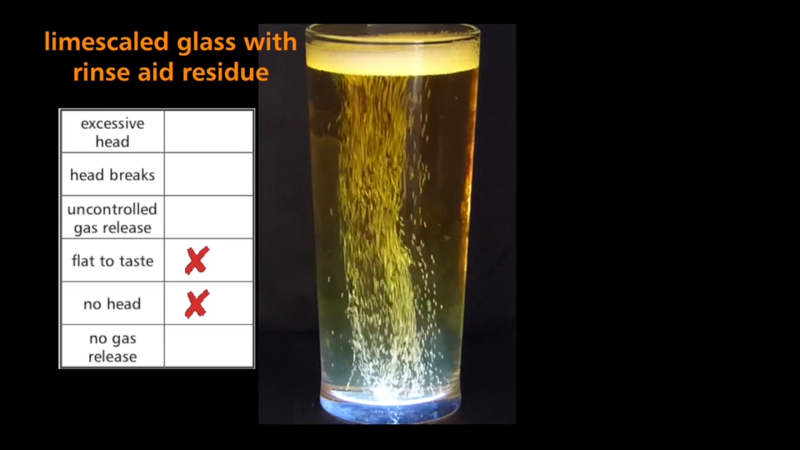 The bubbles are still rising from the bottom of the glass in a controlled manner. While this glass is still nice and clean, there is some limescale in it, from a small build up in the glass washing machine used to clean it. Because of this, the head has grown excessively and breaks down unevenly over time. The gas is escaping very quickly, and the drink will be flat to taste very rapidly. 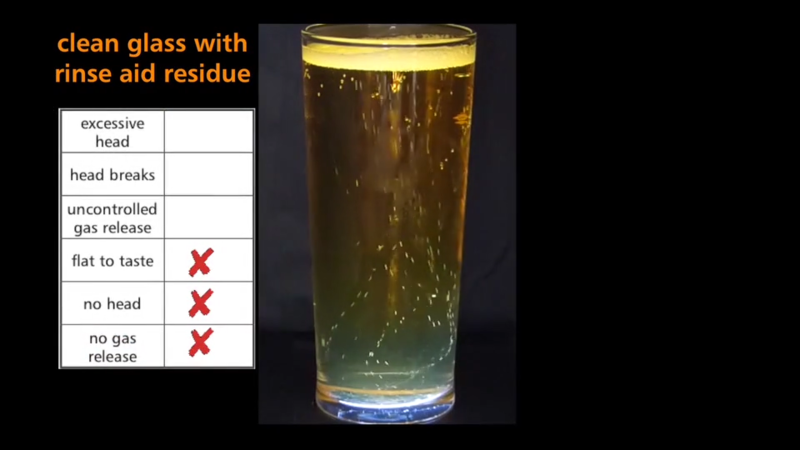 This glass was washed in a machine with the rinse aid dosing turned up to high, and therefore has come out of the machine coated in residue from the rinse aid. There is no head, and no glass release to speak of, and the lager is flat to the taste. 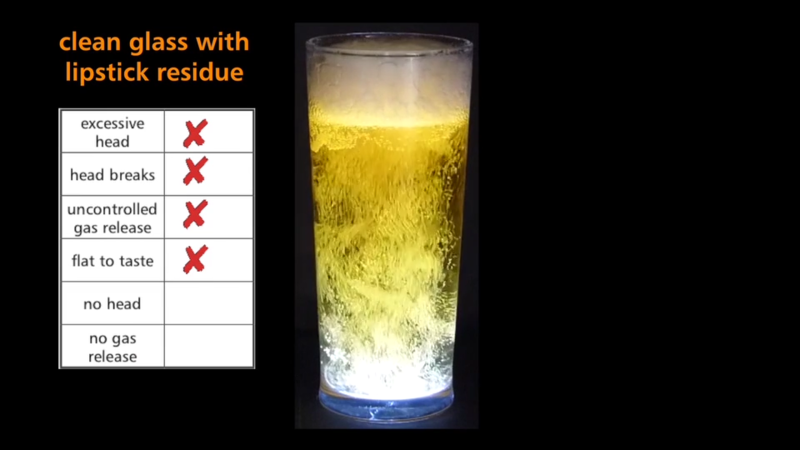 This glass is suffering from limescale deposits and has been washed with too much rinse aid. 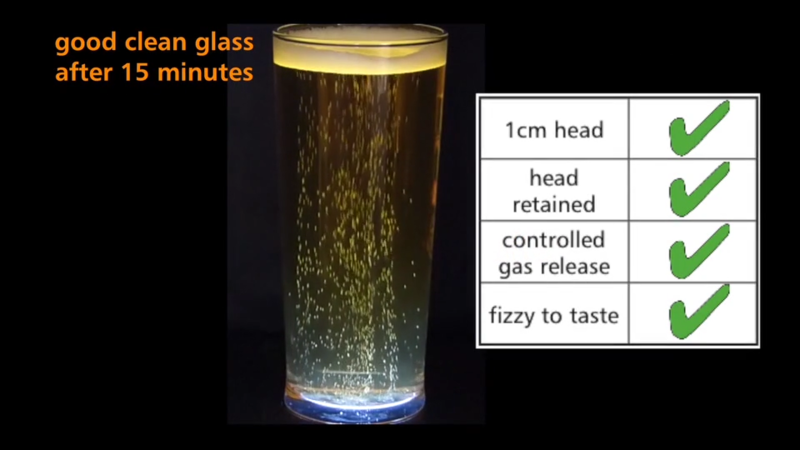 Because of this, there is not head on the pint, and the drink will be flat to the taste, but bubbles are being released from the bottom of the glass, they aren't controlled and will dissipate rapidly. While this glass might appear clean, it still has some lipstick residue left on it from a previous drinker. 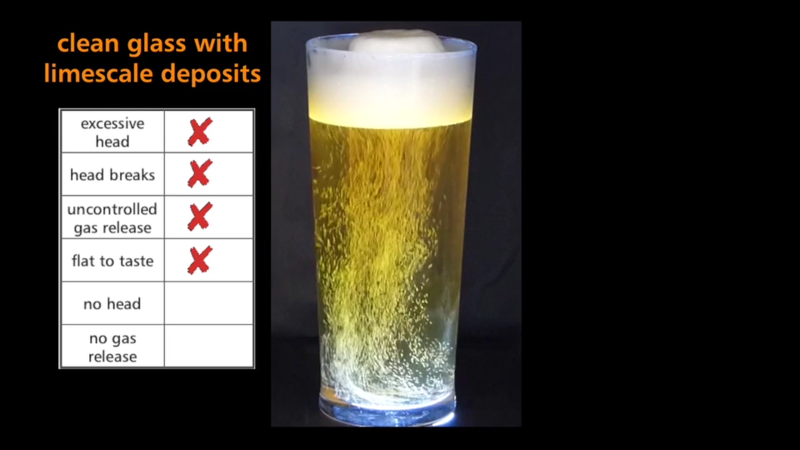 The gas is escaping from the drink very quickly, and rapidly the beer will be flat to the taste. There's also an excessively large head at the top of the drink, which breaks down quickly and unevenly. 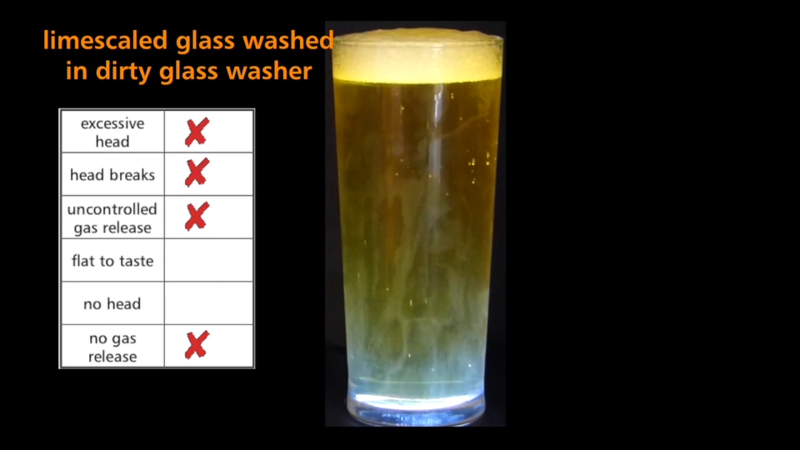 The above glass has been washed in a glasswasher with limescale build up which has been transferred to the glass. It has also still got the residue of a previous drinkers lipstick. 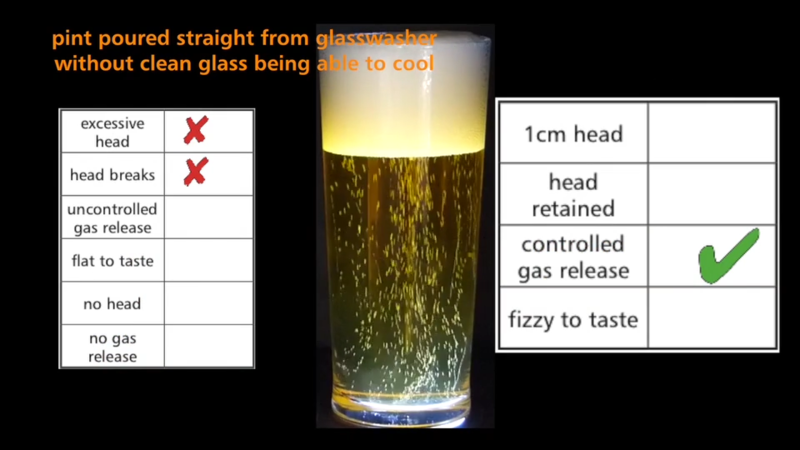 While there is a 1 cm head at the top of the glass, which is retained decently, it breaks apart unevenly. 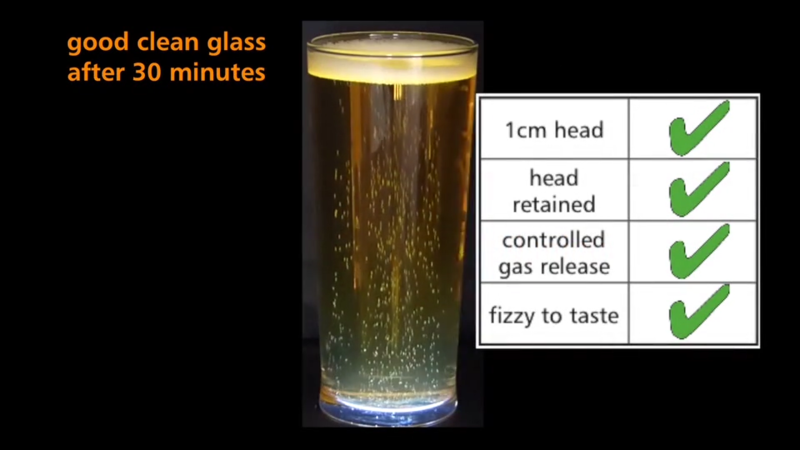 The gas is being released quickly, and rapidly the drink will be flat to taste. This glass was poured straight into a warm glass, directly taken from a glasswasher. The head is excessively large and breaks apart quickly, but the gas is being released evenly. 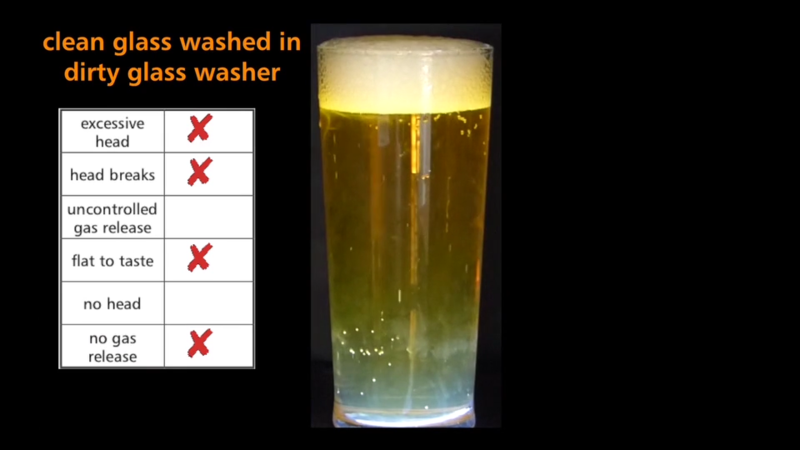 This glass has limescale deposits from the inside of the glasswasher that has just been removed from, and the lager has been poured into it without allowing the glass to cool down. The head is excessively large and breaks apart unevenly. The gas is being released from the drink uncontrolled. This clean glass has just been washed in a machine that hasn't been cleaned. The head is more significant than it should be and breaks apart unevenly. 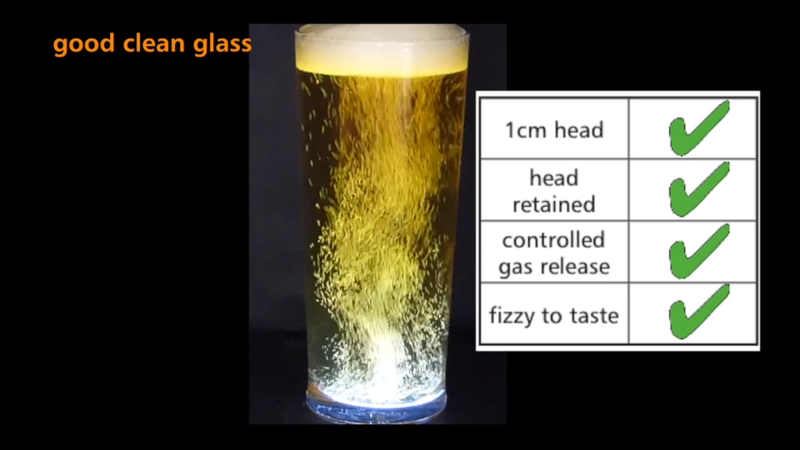 The drink is flat to the taste, and despite being in a glass that promotes fizz, there is no gas release to be seen. 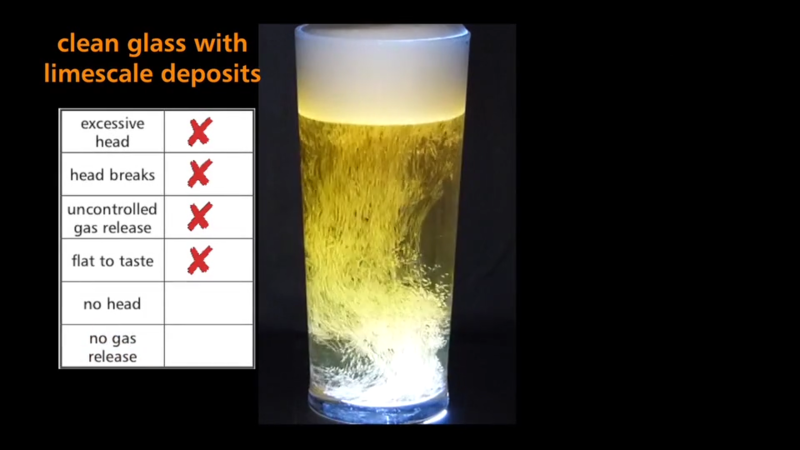 As you can see from the images above, Limescale leads to excessive fizzing, too much head and beer that will go flat prematurely. Rinse aid residue (from the dosage of the chemical being set too high in the machine), lipstick, heat and a dirty glasswasher can all have a defoaming effect, which will make the head go flat. Limescale absorbs lipstick, rinse aid and dirt and exacerbates the problem.